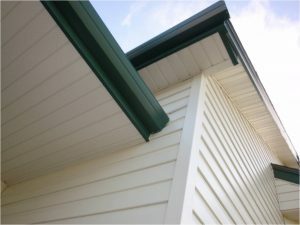 For soffit and fascia that will protect the eaves and edges of your roof, turn to ABC Seamless Siding & Windows. We are a family-owned and -operated home improvement company that has been serving homeowners in Nixa, Missouri, and all the surrounding communities since 2007. Our seamless steel home exterior products are the finest sold on the market and will provide your home with valuable protection while also making it look amazing. Durability – Our home exterior products are made of a robust, 28-gauge, G90 galvanized steel, so they will look great for decades without showing signs of wear and tear. Mold protection – Steel is far better at preventing mold and mildew growth in your home’s rafters and attic than other materials, such as vinyl. Curb appeal – These products make an excellent finishing touch to our steel siding, and are available in numerous different colors so you can achieve a look that reflects your personal taste. For more information on the steel soffit and fascia we have available for installation on homes in Nixa, MO, and the surrounding communities, contact ABC Seamless Siding & Windows today.